Founded in 1789, this is the oldest and most famous cemetery in New Orleans. It’s known for its oven vaults and ornate crypts whose design was influenced by the French and Spanish. Aboveground tombs were used because the swampy location was prone to flooding. After recurrent vandalism, the Archdiocese of New Orleans instituted a requirement last January that visitors have to be accompanied by licensed tour guides. Notable graves include Marie Laveau (the Voodoo Queen) and Homer Plessy (of Plessy vs. Ferguson, “separate but equal”). Film fans may recognize it as the backdrop for scenes in Cincinnati Kid and Easy Rider. Established in 1864, this 624-acre U.S. military cemetery is located just across the Potomac River from Washington, DC. It is the only cemetery to hold soldiers’ graves from every war in U.S. history; additionally, 4,000 former slaves are buried there. Behind the rows of white tombstones, visitors come to see the Tomb of the Unknown Soldier and the Space Shuttle Challenger Memorial. This year, the cemetery has enhanced the visitor experience with the addition of a trolley. Notable graves include President John F. Kennedy and Jacqueline Onassis, Robert F. Kennedy and Edward “Ted” Kennedy. Founded in 1899, the cemetery is located adjacent to the north wall (back) of Paramount Studios. It has become the resting place for hundreds of stars. Visitors can access unique touch screens and consoles with video, film clips, written and spoken words that tell the stories behind the lives of the celebrities buried there. The stories are also available on the cemetery website. Notable graves include Charlie Chaplin Jr., Rudolph Valentino, Mickey Rooney, Nelson Eddy, Jayne Mansfield, Peter Lorre and more. L.A. Story with Steve Martin as well as TV shows like Dexter and 90210 were filmed here. A popular Dia de Los Muertos festival is held each fall. Spread over 175 acres, this cemetery founded in 1831 is considered the model for the “rural cemetery” movement. It has inspired other garden cemeteries in America and preceded the country’s public parks program. It’s known for its flowering trees and shrubs, and serves as a wildlife refuge. More than 60,000 monuments tell the stories of 95,000 people buried here. Notable graves include activist Dorothea Dix, artist Winslow Homer, and poet Henry Wadsworth Longfellow and his wife, who is buried beside him. Founded in 1877, this late Victorian era cemetery is located on a mountainous plateau with scenic views of Deadwood Gulch and the Black Hills. Visitors pay their respects by leaving piles of rocks, coins and glass at the gravesites. About half of the 3,627 burials recorded have permanent grave markers. Notable graves include western legends like Wild Bill Hickok and Calamity Jane. Founded in 1849, this 90-acre cemetery in the Hudson Valley is accessible by train from Manhattan. 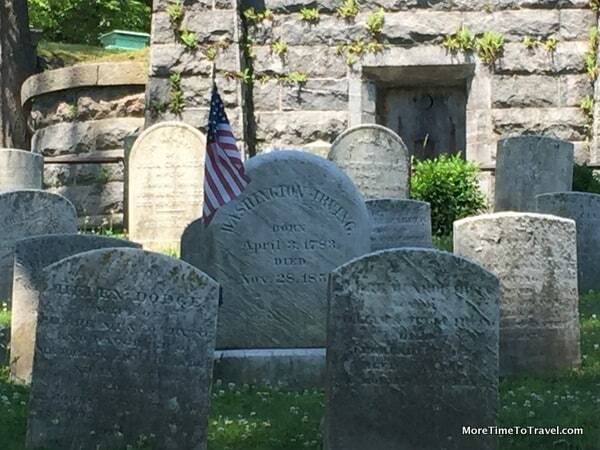 People from all over the world come to visit the grave of Washington Irving, author of The Legend of Sleepy Hollow and Rip Van Winkle. Located behind a cast iron gate with his family name, it is marked with a simple white marble tombstone. Guided tours, including nighttime lantern tours, explain the cemetery’s art, architecture and life stories. Visits here are especially popular around Halloween. Notable graves include Andrew Carnegie, Walter Chrysler, William Rockefeller, Elizabeth Arden, Brooke Astor, and Leona Helmsley and her husband Harry. Straus Mausoleum at The Woodlawn Cemetery, the gravesite of Isidor Straus (co-owner of Macy’s Department Store). He and his wife Ida both died aboard the Titanic and are memorialized on the nearby monument depicting a lifeboat from the ship. This sprawling 400-acre cemetery (founded in 1863) is often called an urban oasis. Built in a landscape-lawn style, it has curvilinear roads, exposed bedrock, and magnificent flowering trees and shrubs. Many of its 1,300 mausoleums and monuments were designed by legendary architects, landscape designers and sculptors. Over 300,000 individuals of diverse cultural backgrounds are buried here; in addition to the jazz greats, they include artists, writers, athletes, business moguls, elected officials, and public servants. Notable graves include Celia Cruz (Queen of Salsa), Herman Melville, Joseph Pulitzer, Irving Berlin and suffragist Elizabeth Cady Stanton. This article by Irene S. Levine appeared as part of a feature story in the Chicago Tribune.